For 1,600 years, this city — Turkey’s largest — has been built and destroyed, erected and erased, as layer upon layer of life has thrived on its seven hills. Today, Istanbul is a city of 13 million, spread far beyond those hills. And on a long-farmed peninsula jutting into Lake Kucukcekmece, 13 miles west of the city center, archaeologists have made an extraordinary find. The find is Bathonea, a substantial harbor town dating from the second century B.C. Discovered in 2007 after a drought lowered the lake’s water table, it has been yielding a trove of relics from the fourth to the sixth centuries A.D., a period that parallels Istanbul’s founding and its rise as Constantinople, a seat of power in the Eastern Roman/Byzantine and Ottoman Empires. Budding archaeologists are needed to help uncover the historical secrets hidden at a woodland site near Hastings. The Woodland Trust is calling for volunteers to help carry out excavation work at Brede High Woods. The site, which is protected by the charity, is located in the High Weald Area of outstanding natural beauty and is home to rare wildlife and a wealth of history. The team, led by Chris Butler Archaeological Services, are hoping to find out more about the Brede Furnace, which was previously situated in the area. Amateur archaeologists are digging through centuries of history on a wooded ridge overlooking Ampleforth in North Yorkshire. Roger Ratcliffe joined them. A cold, wet and blustery winter’s day seems an unlikely time to find volunteers – people who could quite easily have stayed at home in front of a fire. But here they are, down on their hands and knees and gently scraping away the bare earth from a windswept hillside. BUDDING archaeologists need to pick up a trowel and get digging in their back gardens. A new project, funded by a £40,800 grant from the Heritage Lottery Fund, has been launched to uncover the history hidden underfoot in Kingsholm. At the launch of History on Your Doorstep on Saturday, Jean Ashmead, of Dean's Way, said she barely has to scrape the surface of her garden to uncover Roman relics. She arrived at the event laden with Roman pottery and an unidentifiable animal's jaw. Droughts are typically bad news, as they can put a strain on a country's people, economy, and infrastructure. But archaeologists are now calling a 2007 drought in Turkey a blessing, after it revealed a piece of history that will yield new information about the country's roots for decades to come. As lack of rain caused the waters of Turkey's Lake Kucukcekmece to slowly pull away from its shore, the ancient harbor town of Bathonea revealed itself. The ruins of buildings, roads, and a sea wall are thought to date back as far as the 2nd century BC, meaning it would have been a thriving community at a time when Byzantium — now Istanbul — was a sprawling metropolis. ARTE has a superb documentary about the excavations of the Theodosian port in Constantinople, discovered during the building of the Istanbul metro under the Bosphorus. The documentary makes excellent use of augmented and virual reality. Soundtrack is available in either French or German. Questions surrounding when and where early modern humans first migrated from Africa to populate the rest of the world have long been a focus of debate and study among scientists, where genetic research has played a key role. Now, recent genetic research study results have been released by an international team of scientists. The research, published January 26 by Cell Press in the American Journal of Human Genetics, suggests that modern humans settled first in Arabia more than 60,000 years ago on their way out through the Horn of Africa. Says senior study author Dr. Luisa Pereira of the University of Porto in Portugal (IPATIMUP): "A major unanswered question regarding the dispersal of modern humans around the world concerns the geographical site of the first steps out of Africa. One popular model predicts that the early stages of the dispersal took place across the Red Sea to southern Arabia, but direct genetic evidence has been thin on the ground." There are plenty of drumlins in County Down - but have you heard of the Mound of Down? If not, that is probably because it has been hidden from public view by trees and gorse for decades. But work is now under way to expose this fortification which could be about 1,000 years old. Tim Campbell, director of the St Patrick Centre in Downpatrick, said it was one of the largest megalithic hill forts in western Europe. A team of archaeologists and students excavate the remains of a major Etruscan center in Italy. A team of archaeologists, students and volunteers will return again during the summer of 2012 to investigate the remains of a major Etruscan port city that straddles the Mediterranean coast of Tuscany, Italy. Located near the Italian town of Piombino, it features one of the most important necropolises in the country, as well as an acropolis and a history that goes back to Etruscan settlers around 900 B.C.E. and a Bronze Age culture that dates back to about 1200 B.C.E. The ancient site is known today as Populonia, a city that was for centuries a prominent Mediterranean center for iron smelting and trade. The "main objective is to fill as many of the gaps as possible in our knowledge of the history of Populonia and its territory, from the late Etruscan period to the late Roman age", reports the team leadership. Co-led by Andrea Camilli (Superintendence for Archaeological Heritage of Tuscany), Giandomenico De Tommaso (University of Florence), and Carolina Megale (Archeodig Project), they intend to focus their investigation on a section of the site's lower city that is still intact, where they have identified evidence of a late Roman building and, beneath that, a part of the Etruscan necropolis. Preserving archaeological information, facilitating access to a wide range of digital documents and data, and enhancing archaeological research are vital services that Arizona State University's Center for Digital Antiquity (http://www.digitalantiquity.org) provides for researchers, students and the public. The Andrew W. Mellon Foundation awarded a grant of $1.2 million beginning in March 2012 that will support the Center's operations and development. The grant enables the Center to greatly expand the content of its digital repository, to enlarge the community of users and to continue development and enhancement of software to improve the repository user's experience. The Center for Digital Antiquity develops, maintains and oversees the Digital Archaeological Record (tDAR – http://www.tdar.org), the country's largest digital repository of world-wide archaeological data and information. The Center was established in 2009 with support from an earlier grant from the Mellon Foundation. A set of bones discovered on a building site in Milton Keynes could be Roman, said a council archaeologist. The remains of more than one person have now been discovered at the Taylor Wimpey development in Oakridge Park. The bones of one skeleton were first unearthed by workers on the site two weeks ago. Forensic archaeologists established that the remains were not of recent origin and therefore not of police interest. It is still an enormous muddy hole from which around 50 lorries a day are taking away excavated London clay, but it is a hole the British Museum is quite proud of. In this hole, it believes, is the key to the survival of the collection. The museum was told on Friday that it could have £10m of lottery cash to help complete ambitious plans for a £135m world conservation and exhibitions centre on the Bloomsbury site's north-west corner. The burial site, containing the bodies of 54 young men, was unearthed at Ridgeway Hill near Weymouth in 2009 ahead of the construction of a new road, but the identity of the bodies within has mystified experts. Because the men's severed heads were piled up on one side of the pit, it was assumed they had been the unfortunate victims of a mass execution. Radiocarbon dating showed that the men had been killed some time around the year 1000, and isotope testing on their teeth found that they were from Scandinavia, suggesting they may have been Viking invaders. Now an archaeologist from Cambridge University has put forward a theory that the men were a gang of Viking mercenaries who were murdered on the order of the English king Aethelred II. A mass grave found in Dorset contains the bodies of an elite ‘hit squad’ of invading Viking warriors, experts claim. All decapitated and buried alongside their severed heads, the 54 skeletons were discovered in 2009 by workmen digging a road. Archaeologists dated their bones to around the year 1,000 but had few other clues as to the identities of the men who met such a sticky end. Now a researcher at Cambridge University claims to have pieced the story together in a documentary to be screened tonight. In one room a student is analysing limpets from northern Spain. In another, soil specimens from Turkish burial grounds are being put under the microscope. Across the courtyard, an ancient cellar is home to endless boxes of everything from bone fragments to shards of Roman pottery. When York University’s archaeology department moved into King’s Manor back in the mid-1990s, they couldn’t have asked for a better location. The 16th century building, once a royal palace and headquarters of Henry VIII’s Council of the North, is an archaeological project in itself. However, behind the arched gateways and stone walls, lies pioneering technology and groundbreaking research which has helped map more than 10,000 years of history both in this country and abroad. The Roman town of Venta Icenorum, meaning market of the Iceni people, was discovered during the 1929-35 excavations and has been a popular place of both local and national interest, with the BBC’s Time Team filming there in 2010. 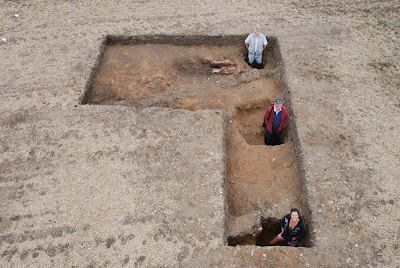 The latest revelation, dating back to third century AD, was discovered by the Norfolk Archaeological Historical Research Society and has recently been unveiled in an academic journal. The structure shows two angled wings, meeting on a central structure, and is described by Professor Will Bowden, who has been working on the project from the University of Nottingham, as “an unusual and adventurous building on a very interesting site”. Scientists have uncovered evidences that show Neanderthals were using red paint up to 250,000 years ago - thousands of years earlier than previously thought. Scientists are upto finding out what the sub-species of humans did with it back then although it is often considered a sign of symbolic behaviour such as artwork and body painting. A new study indicates that social networking is an integral part of humankind's nature, carried down from ancient humans who lived tens of thousands of years ago. This was Hadza land, a type of rugged African landscape that we have all seen in pictures and movies about the African Serengeti. Coren Apicella and her research assistants were frequently on the move, traveling the region by Land Cruiser, struggling to cross mud-drenched trails. At one location, they had to lay felled trees on the ground in order to advance, and at another point, they had to flee a horde of elephants. But it all came with the territory. They were studying a nomadic people called the Hadza, or Hadzabe, an ethnic group of people in north-central Tanzania, living around Lake Eyasi in the central Rift Valley and in the neighboring Serengeti Plateau. The Hadza people number less than 1,000 in total population. Roaming over 4,000 square kilometers of the African landscape, several hundred of them still live as hunter-gatherers, much as their ancestors lived tens of thousands of years ago before the invention of agriculture. Some consider them to be the last full-time hunter-gatherers in Africa. To Coren and other researchers, they offer an interesting case for ground-breaking research and discovery about the dynamics and evolution of social networking in the human family, one element that made modern humans what they are today. One might argue that the stone age technology among people living in Russia during the Mesolithic and Neolithic ages was relatively unimpressive. But the fishing equipment of a certain group living near present-day Moscow more than 7,500 years ago would be something to shout about, according to archaeologists. An international team of archeologists, led by Ignacio Clemente, a researcher with the Spanish National Research Council, has discovered and documented an assemblage of fish seines and traps in the Dubna Basin near Moscow that are dated to be more than 7,500 years old. They say that the equipment, among the oldest found in Europe, displays a surprisingly advanced technical complexity. The finds illuminate the role of fishing among European settlements of the early Holocene (about 10,000 years ago), particularly where people did not practice agriculture until just before the advent of the Iron Age. A mass grave in Dorset containing 54 decapitated skeletons was a burial ground for violent Viking mercenaries, according to a Cambridge archaeologist. The burial site at Ridgeway Hill was discovered in 2009. Archaeologists found the bodies of 54 men who had all been decapitated and placed in shallow graves with their heads piled up to one side. Carbon dating and isotype tests revealed the bodies were Scandinavian and dated from the 11th Century. New published research from anthropologists at the University of Kent has scientifically supported for the first time the long held theory that early human ancestors across Africa, Western Asia and Europe engineered their stone tools. For over a century, anthropologists have debated the significance of a group of stone age artifacts manufactured by at least three prehistoric hominin species, including the Neanderthals (Homo neanderthalensis). These artifacts, collectively known as ‘Levallois’, were manufactured across Europe, Western Asia and Africa as early as 300,000 years ago. Levallois artifacts are flaked stone tools described by archaeologists as ‘prepared cores’ i.e. the stone core is shaped in a deliberate manner such that only after such specialised preparation could a prehistoric flintknapper remove a distinctive ‘Levallois flake’. Levallois flakes have long been suspected by researchers to be intentionally sought by prehistoric hominins for supposedly unique, standardised size and shape properties. However, such propositions were regarded as controversial by some, and in recent decades some researchers questioned whether Levallois tool production involved conscious, structured planning that resulted in predetermined, engineered products. rchaeologists excavating what they claim is Britain's oldest house have secured more than £1m in funding. The circular structure at Star Carr near Scarborough was found in 2008 and dates from 8,500BC. Archaeologists from the Universities of Manchester and York say the site is deteriorating due to environmental changes. The European Research Council has given them £1.23m to finish the work before information from the site is lost. ARCHAEOLOGISTS have examined the secret Furness site where a hoard of silver Viking booty was unearthed by a metal detectorist. In Easter last year a local enthusiast discovered 92 pieces, made up of a number of very rare silver coins and assorted artifacts. The hoard, dated to around 955, was officially declared treasure in September. It has been described as “the missing link” by experts, who say it is the long-awaited evidence of a material culture of the 9th and 10th Century Vikings who settled in the Furness peninsula. Applications are now open for our annual Sutton Trust Summer School in Anglo-Saxon, Norse & Celtic, which will take place on 13th-17th August. The Sutton Trust is an organisation which seeks to promote social mobility through education, and each year participants in our Summer School are given the opportunity to experience life as a Cambridge undergraduate: staying in a College, attending lectures and seminars, and receiving one-to-one or small group 'supervisions' on the languages, literatures, and history of medieval Britain, Ireland and Scandinavia. More information on how to apply is available via the University's webpages. There is a new blog on the use of the iPad in archaeology. Archaeology and the iPad sets out to be a forum and a source of news on mobile computers in archaeology. Two new 21st century inventions are helping us to understand and visit the wonders of Stonehenge from the comfort of our own homes. ‘Google Under-the-Earth’ is an extension of the well known ‘Google Earth’ and adds archaeological layers to the base levels. ‘Seeing beneath Stonehenge’ has been developed as part of the Stonehenge Riverside Project, using data gather by the combined team from the Universities of Sheffield, Manchester, Bristol, Southampton and London. Google Under-the-Earth: Seeing Beneath Stonehenge is the first application of its kind to transport users around a virtual prehistoric landscape, exploring the magnificent and internationally important monument. AN amateur historian from Yorkshire claims to have discovered a new Viking king of York. Musician and poet Damian Bullen has developed a theory after reading about the Silverdale Haul, a collection of coins and jewellery found in Lancashire in September, of similar designs to coins from about 900AD. One of the Medieval coins has a design which has never been seen before, and carried the name Airdeconut, believed to be a derivation of Harthacnut, an early king of England and Denmark. A modern day boat builder is being challenged to recreate one of the oldest boats found in western Europe, dating to around 1500 BCE. The prehistoric boat will be built using ancient tools including bronze axes at the National Maritime Museum Cornwall in Falmouth, as part of a collaborative project devised by the University of Exeter. The construction will be overseen by a professional boat builder as they begin building their ‘sewn-plank boat’ in April. The CBA has recently awarded three small grants to projects involving individuals or voluntary groups carrying out original research. There are still a few places left for the EMAS Easter study tour to south west Ireland. The study tour Runs from the 5 to the 11 April, and is based in Cork. Full details, including the detailed itinerary are available on the web. Places are limited, as we have to use a small coach because of the roads! The remains of a 300-year-old warship are to be raised from the sea bed, according to reports. The wreck of HMS Victory, a predecessor of Nelson's famous flagship, was found near the Channel Islands in 2008. The British warship, which went down in a storm in 1744 killing more than 1,000 sailors, could contain gold coins worth an estimated £500m. There are enough significant archaeological discoveries made every year in Greece to fill entire museums. This was also the case in 2011, despite a drop in financing for research as a result of the economic crisis. The authoritative weekly To Vima (The Tribune) has drawn up a list of the ten most important archaeological discoveries of 2011. The works, the publication says, were not listed according to their importance, as that can only be established after further studies. 1) A small 2,500-year old wooden statue in perfect condition. The impressive find was made in the Sanctuary of Artemis in Vravrona during building works on the archaeological site’s drainage well. Other objects were found alongside the statuette, all of them dating from the 5th century BC. THE Pictish Arts Society is pleased to welcome Dr Fraser Hunter, who will deliver the first talk of the New Year at Pictavia, Brechin on Friday, January 20. Dr Hunter is Head of Later Prehistory and Early History in the Department of Archaeology at the National Museum of Scotland. He is a well-known expert in the field of metal and jet working at that period, and has devoted much time to the study of Roman and native interaction and to the development of Celtic Art in North Britain. DETAILED research is under way for a revised scheme to protect one of Yorkshire’s worst flooding blackspots amid concerns archaeology dating from the Roman era could cause further delays. A feasibility study has been commissioned on the flood defence scheme for Pickering after the original proposals were halted in June last year when it emerged the costs had almost tripled to £3.2m. The study is expected to be published at the end of March before a decision is made on the exact design of earth embankments which are planned to hold back up to 17.5m gallons of water from Pickering Beck. Rosslyn Chapel bones to be dated? Permission is being sought from Historic Scotland to radiocarbon date human bones found beneath Rosslyn Chapel. The remains of three skeletons were discovered under the flagstones of the historic church, while it was undergoing its recent restoration. The religious building, which gained worldwide fame in the book and movie of the Da Vinci Code, has been the focus of archaeological studies since 2008. But the temple was also about to become Britain's most mobile Roman site. Fifty-seven years ago it was in the way of an office block development and had to be shifted. Now, almost 2,000 years after it was first built, it is on the move again to make way for the headquarters of Bloomberg. In 1954, the temple was front-page news day after day, attracted half-mile queues and was watched across the nation on Movietone news. Its fate was anxiously discussed at cabinet meetings and watched with close interest by the prime minister, Winston Churchill. Archaeologists in Prague-Bubenec have uncovered a site with the oldest traces of ploughing and a field in the Czech Lands, that date back to the mid-4th millennium B.C., Archaeological Institute spokeswoman Jana Marikova has told CTK. The research in two streets, completed late last year, also uncovered a rich evidence on the area's population in later periods, from the Celtic people and German tribes to the early medieval inhabitants, Marikova said. Probably the most important find is the system of four approximately parallel lines that are nine metres long, ten metres wide and eight centimeters deep, which archeologists say, are furrows. Experts believe the furrows date back to the earlier phase of Copper Age, i.e. between 3800 and 3500 B.C. a symposium in memory of Dr David Hill. Papers are being invited from scholars who were close to David, but if others would like to offer papers, submissions are welcome. Academics from the University of Exeter, overseen by a professional boat builder, are to reconstruct a Bronze Age ship. The ship will be built of oak planks stitched together with flexible yew stems at the National Maritime Museum in Falmouth. The aim is to see how seaworthy the vessels were when they were in use 4,000 years ago. Building is expected to start in April and last five months. Over three thousand years ago the inhabitants of a small southeast fenland community were skilled boat builders, enjoyed fishing, and practised a method of eel trapping still in use today in East Anglia. The incredibly detailed picture of Bronze Age life discovered on the River Nene, at Must Farm quarry, Whittlesey, has everything from well preserved boats, spears and swords to clothing and jewellery as well as carved bowls and pots still full of food, making it one of the most significant sites of its kind ever found in Britain. recent call to local people to report anything unusual that they have spotted at the shoreline or under the sea has already resulted in several promising sites for a new archaeological project. Tip-offs from islanders led to a possible medieval fishing village and finds of 5,000-year-old pottery submerged in a loch. A local man – JJ McDonald – told the team that he knew of a “medieval fishing station”. Photographed from above, the landscape shows high potential for new site discovery of all periods of history. Notably, this area near North Loch Euport is called ‘Havn’ (the Norse word for harbour) on Ordnance Survey maps. A previously unknown complex of fish traps and evidence of coastal occupation south of Lochboisdale on South Uist was discovered during flight surveys. Theresa McDonald, Managing Director of the Achill Archaeological Field School, voiced her objections this week over the Achill-Henge which was built at Pollagh in November by Joe McNamara. The archaeologist believes that a prehistoric site could be less than half a kilometer from where Achill-Henge is now standing. The Achill-Henge was constructed in November by architect Joe McNamara and resembles the famous Stonehenge structure. The processes behind building the oldest boat ever found in Western Europe will be investigated by a team of modern- day maritime experts. Archaeologists from the University of Exeter will lead the project at the National Maritime Museum in Falmouth as they attempt to rebuild a sewn-plank boat, examples of which date to around 2000 BC. The Bronze Age vessels, which measured up to 16 metres in length, are thought to have been unique to England and Wales. "Because none of the boats have ever been found as complete boats, this project will seek to understand how they were constructed, how to steer such a long boat, measure how fast it can go, understand how the crew used paddles, as sails were not evident, and how watertight it is," said Professor Robert Van de Noort, an archaeologist at the University of Exeter. A set of bones which could be thousands of years old has been discovered on a building site in Milton Keynes. The human remains were uncovered by a digger driver at the Taylor Wimpey development in Oakridge Park. An investigation will now determine whether the site in Heathley Chase is of historical significance. Archaeologists in Bulgaria announced on January 12 2012 that they had found a unique ceramic relief of a Thracian Horseman – a key figure in cult worship – estimated to date from the fourth century BCE, at the country’s Perperikon site. Perperikon, an ancient site of worship that has hosted more than one forms of faith over the centuries, regularly has yielded astonishing archaeological finds. Bulgarian National Television reported that the image of the Thracian horseman was found 300 metres from a small hill, known as Besik Tepe, at Perperikon. Paleoanthropologists agree that modern humans evolved in Africa about 200,000 years ago, yet the fossil evidence for the earliest examples of Homo sapiens is scarce. One problem is the difficulty in recognizing true modern humans in the fossil record: At this time, many of the fossils thought to be early members of our species possess a mix of modern and primitive traits. For some paleoanthropologists, it means our species once had a greater range of physical variation than we do today. For others, it means more than one species of Homo may have lived in Africa at this time, sharing some traits in common. Despite the challenges of identifying early humans, there are several candidates for the earliest known members of our species. Here’s a look at some of the top contenders. A Roman helmet which was buried in a Leicestershire field for around 2,000 years has been displayed at the British Museum. It was in hundreds of pieces when it was found in Market Harborough, in 2000, and has since been put back together. Ken Wallace said when he discovered the helmet the metal fragments looked like "crushed cornflakes". Mr Wallace added that he was amazed by its restoration by experts at the British Museum. Church Warden Andrew Netting said the stone, measuring 51cm (20in) by 35cm (14in), featured a carving of a female figure wearing a cloak. Mr Netting said the slab had been marked with the forensic tracing system - Smartwater. A rchaeologists at the University of York have secured major European funding to carry out sophisticated new research at one of Europe’s most important Early Mesolithic sites. A team led by Dr Nicky Milner has won a €1.5 million grant from the European Research Council to develop a high-resolution approach to understanding how hunter-gatherers adapted to climatic and environmental change between 10,000 and 8,000 BC at Star Carr in North Yorkshire. Last year a team of archaeologists, from York and the University of Manchester, discovered Britain’s earliest surviving house. The house dates to at least 9,000 BC – when Britain was part of continental Europe. The research team unearthed the 3.5 metres circular structure next to an ancient lake at the site, near Scarborough, which archaeologists say is comparable in importance to Stonehenge. They also excavated a well preserved 11,000 year-old tree trunk with its bark still intact and the earliest evidence of carpentry in Europe. A rare Roman cavalry helmet dating from Emperor Claudius' invasion of Britain nearly 2,000 years ago was unveiled on Tuesday after painstaking restoration lasting nearly a decade. At the time, archaeologists used to finding more instantly recognizable gold and silver coins joked that they had unearthed a fairly modern "rusty bucket." To the naked eye, the white, powdery substance appeared to be plaster. That’s what the professional and volunteer archaeologists at a dig in Israel concluded. Archaeologists' chance encounter with an islander has led them to the site of a possible medieval fishing village on the Western Isles. The site is among potential new historic finds made along the islands' coasts following tip offs from members of the public. Archaeologists said they were told about the village after bumping into local man JJ MacDonald. A new study conducted at a medieval burial site in Albania suggests that a modern infectious disease has been with us since at least the Middle Ages. Researchers, who performed DNA analysis on the skeletal remains found in the Albanian city of Butrint, said the skeleton had contracted Brucellosis around 1000 years ago. "For years, we had to hypothesize the cause of pathological conditions like this," Earth Times quoted associate professor of anthropology Todd Fenton as saying. "The era of DNA testing and the contributions that DNA can make to my work are really exciting." The Global Heritage Network (GHN), the world's first early warning and site monitoring system dedicated exclusively to endangered cultural heritage sites in developing countries, became operational in March of 2011. Since then, GHN efforts have been joined by hundreds of conservation experts around the world. The Network features updated satellite imagery for 175 of the developing world’s most significant archaeological and cultural heritage sites, including profile information on at least 80 of those sites. The Network has been spotlighted by major media organizations such as National Geographic and USA Today. What may come as a surprise to many, however, are some of the world's long-held, well-known "celebrity" sites that the GHN has determined to be in need of urgent rescue: Egypt's Ancient Thebes with its necropolis, as well as Ancient Abydos; Leptis Magna, Libya; Great Zimbabwe National Monument in Zimbabwe; and Tiwanaku, Bolivia. These are sites that are defined as "in critical need of conservation intervention to ensure long term preservation". The less urgent but still critical "at risk" designation has been assigned to such other well-known sites as Petra, Jordan; Teotihuacan, Mexico; Egypt's Memphis and its necropolis and the pyramid fields from Giza to Dahshur; Ur, Iraq; and lesser-known Göbekli Tepe, Turkey, a site that is considered perhaps the oldest Neolithic monumental center in the world. And "destroyed" are the cultural landscape and archaeological remains of the Bamiyan Valley in Afghanistan (which made relatively recent news headlines) and the Allianol Roman Bath complex in Turkey. These are "sites that have been completely destroyed due to natural disasters, looting, war & conflict, development pressures, or other factors". Finding answers and the tales they reveal made Adam Daubney want to become an archaeologist more than anything else. "I love problem solving and the research and being part of a profession where you can add to this growing bank of knowledge and interpret that for the public," says the 32-year-old. ARCHAEOLOGISTS have secured more than £1 million in funding to delve deeper into the history of Britain’s earliest surviving house discovered in North Yorkshire, writes Daniel Birch. 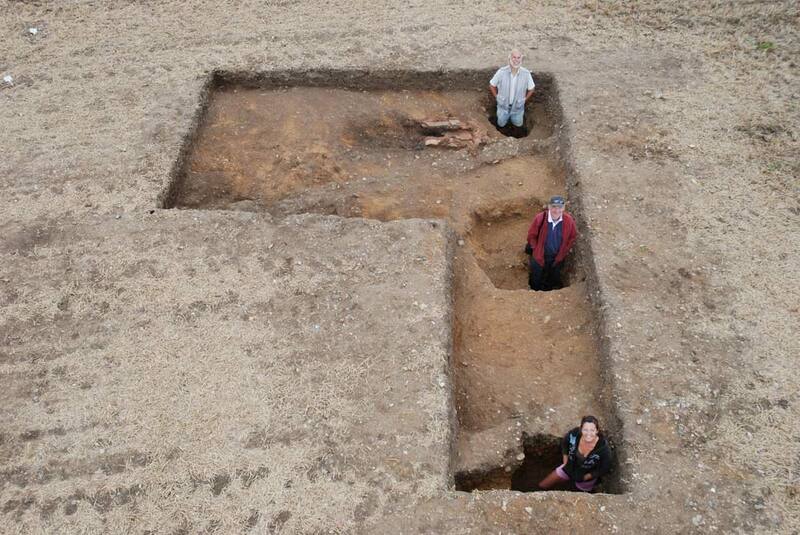 A team of archaeologists from the universities of York and Manchester helped unearth the house at Star Carr, a Stone Age site, near Scarborough, in 2010. The wooden house, which is 3.5 metres wide, predates the house previously thought to be Britain's oldest house in Howick, Northumberland, by at least 500 years. It sits in the ancient heart of Rome and is an emblem of the city's imperial history as well as an icon of Italy. But plans to restore Rome's nearly 2,000-year-old Colosseum are causing rumblings among heritage workers and restorers, compounded by reports in December that small amounts of powdery rock had fallen off the monument. The current $33 million (25 million euro) restoration plans to restore the Flavian amphitheater, which once hosted spectacular shows and gruesome gladiatorial battles, are being sponsored by Diego della Valle, of luxury Italian brand Tod's, in exchange for advertising rights. The tombs of Pompeii, the Roman city buried by a volcanic eruption in A.D. 79, had a litter problem. Animal bones, charcoal, broken pottery and architectural material, such as bricks, were found piled inside and outside the tombs where the city's dead were laid to rest. To explain the presence of so much garbage alongside the dead, archaeologists have theorized that 15 years before the eruption of Mount Vesuvius, an earthquake left Pompeii in disrepair. The mayor of the Sicilian city of Agrigento said Thursday that he would not sell one of Italy's prime archaeological treasures even for 40 billion euros after it reportedly attracted the interest of Russian industrialist Mikhail Prokhorov. The land surrounding a mysterious ancient monument in Sherwood Forest is to be researched after a local history group received a £50,000 lottery grant. A Thynghowe or Thing, an open-air meeting place where Vikings gathered to discuss the law, was discovered in Sherwood Forest seven years ago. Experts surveyed the site this year and suggested the wider area be looked at. The Friends of Thynghowe now plan to search for further evidence of Vikings including a "court circle". A team of archaeologists from INRAP have recently completed an excavation at the foot of the ramparts of Mont-Saint-Michel, uncovering the remains of the Tower of Denis, a fortification tower built sometime around 1479 and destroyed in 1732. Curated and financed by the Regional Direction of Cultural Affairs of Basse-Normandy, this intervention is part of a project to reconstruct the maritime aspect of Mont-Saint-Michel and to restore its fortifications. In 1997, archaeological test-pits revealed the remains of the Tower of Denis located at around 1.5 metres below the current shore level. The archaeologists had to remove nearly 300 m3 of sand and sediments using a mechanical excavator. They also had to build a wide bank to protect the excavation from high tides. Years from now, when we look back on 2011, the year will almost certainly be defined by political and economic upheaval. At the same time that Western nations were shaken by a global economic slump, people in the Middle East and North Africa forcefully removed heads of state who had been in power for decades. "Arab Spring," as the various revolutions have collectively been named, will have far-reaching implications, not just for the societies in which it took place, but also for archaeology. No year-end review would be complete without polling archaeological communities in the affected areas to determine whether sites linked to the world's oldest civilizations, from Apamea in Syria to Saqqara in Egypt, are still intact. Our update appears here. Of course, traditional fieldwork took place in 2011 as well. Archaeologists uncovered one of the world's first buildings in Jordan. In Guatemala, a Maya tomb offered rare evidence of a female ruler, and, in Scotland, a boat was found with a 1,000-year-old Viking buried inside.